If you are looking for the best budget PC case, but you’re not actually sure on what to buy, then you have come to the right place! At TechNewsToday, we strive to deliver proper guidance and counsel to our readers. This review focuses on affordable ones, helping you make the right decision when buying one. It is true that having a top-quality computer case can significantly improve your gaming experience. Now, let’s take a look at 10 of the most attractive and practical budget computer cases available on the market. The first one in our comprehensive list comes from FSP and it is a superb gaming case suitable for those who love cool lighting options. It comes with 4 preinstalled 120mm RGB fans which ensure that the PC components never get too hot. On top of that, the LED fans can also display a beautiful light show as you can switch between 5 different lighting modes using the incorporated RGB controller! When it comes to space for components, you have up to 7 PCI expansion slots to play with as well as 2 bays for HDDs and 2 bays for SSDs. This means that you can add multiple terabytes of memory with little to no effort, storing all your favorite games, movies, and music. If for some reason you need more cooling power, FSP supports a 360mm water radiator, so you can benefit from both air and water cooling in the same frame. Connectivity-wise, this model also comes with 2 high-speed USB 3.0 ports and 1 USB 2.0 port for those of you who still love old-school connection options. 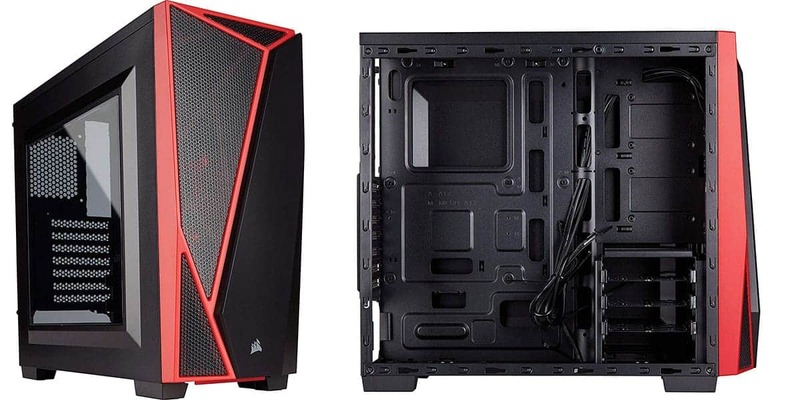 At the end of the day, this mid-tower PC case is ideal for both beginner and professional gamers. For more detailed information on cases with cooling power, check out our Best Water Cooled PC Cases review. This unit comes equipped with side glass panels which apparently are very fragile, as mentioned by a couple of users. When attaching the panels, make sure they don’t slip and fall as they can immediately shatter into a thousand pieces. If you want a good all-rounder and affordable, you cannot go wrong with the Carbide Mid-Tower Gaming Case from Corsair. Of all the Mid Tower PC Cases , it is a bestseller at the moment of this writing and comes from a reputable manufacturer. 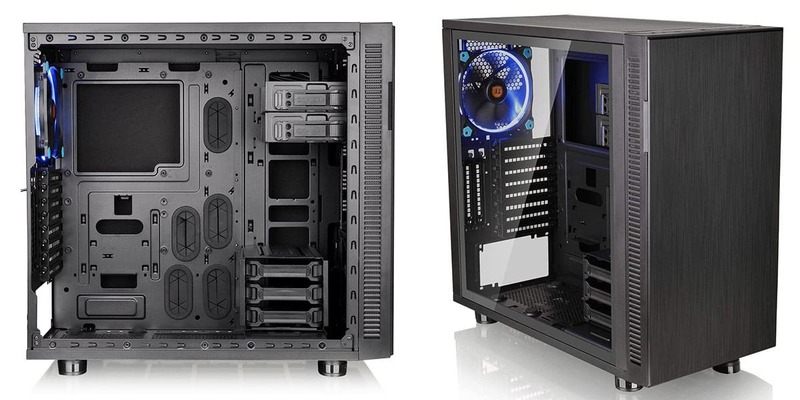 The Carbide mid-tower gaming case from Corsair comes at an affordable price and features. It has an eye-catching design without compromising on functionality, measuring about 17 inches in depth, 8 inches in width and 19 inches in height that can fit perfectly on almost any gamer’s desk. Another great advantage of this is that it consists of the cable routing system. The case comes with multiple cut-outs and tie-downs which allow users to hide annoying cables from sight, maintaining a clean and attractive workspace. When it comes to cooling options, users can add up to 5 different fans with a maximum CPU cooler height of 150mm. It already includes an installed fan, so you can basically use it right out of the box, without installing additional components. If you are worried about memory, this product supports up to 4 DDR4 RAM memory slots, so you can make your computer as powerful as possible. Dismantling the case can be done very easily using a basic screwdriver, so you don’t need complex tools to create your dream gaming computer. As a drawback, some buyers complained that the build quality isn’t the best in town as the power button can become stuck and cause annoying issues in the long run. Secondly, touching the I/O panel the wrong way can also make the computer to restart, so be mindful of that. The NZXT H500 ATX PC Case is also a thing of beauty! This White PC Case features a minimalist design which includes discrete cable routing cut-downs and straps, so you can have a more organized and tidy space. Another beautiful feature consists of the glass panel which allows you to look at the components of your gaming PC while running. Just imagine boasting about your build when you have friends over! When it comes to cooling options, this computer gaming case has 2 pre-installed 120mm fans which help to maintain the correct operating temperature, even when you run complex applications and games. It also offers support for water cooling as it features a front radiator slot of up to 280mm and one rear radiator support of up to 120mm. The extension slots are also pretty numerous – up to 7. 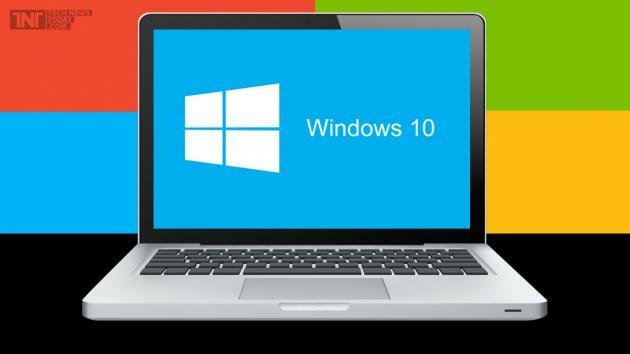 You can also install a few SSDs or HDDs, depending on your storage needs. If you are wondering about connectivity options, it comes with 2 USB 3.1 ports which ensure fast transmission speeds between your devices. Although this is a beautiful case that looks great on any desk, it can be quite tough to disassemble it. Some customers reported that they had to use brute force and multiple tools to detach the panels to add more components. The instructions manual doesn’t help much either as it contains a set of pictures and that’s pretty much it. If you’re a DIY type of guy then you probably won’t have a problem assembling and disassembling it, but if you’re not, you’ll need a lot of patience, my friend! The MasterBox Pro 5 gaming case from CoolerMaster will take your breath away as soon as you see it! This is a bestseller at the moment of this writing and comes jam-packed with useful features such as the 3 front-mounted RGB fans which display a wonderful light show each time. You actually have the possibility to independently control the lighting mode on each separate fan and at the back of the unit, you’ll discover another LED fan which blows out hot air, ensuring that the PC components remain cool while operating. If 4 120mm fans are not sufficient for you, there’s enough space in the front for a 360mm radiator for liquid cooling. When it comes to storage options, this unit features flexible SSD mounting options and multiple expansion slots. Another exquisite feature consists of the 4mm tempered glass panel which doesn’t look great, but also allows you to see your gaming PC operating at full blast while running the latest online games! Although the manufacturer advertises the glass panel as being “tempered” which basically means reinforced for additional durability, one customer reported that the panel was broken upon arrival. However, this could happen due to improper handling by the shipping guys. If this happens to you, contact the manufacturer right away and ask for a replacement. 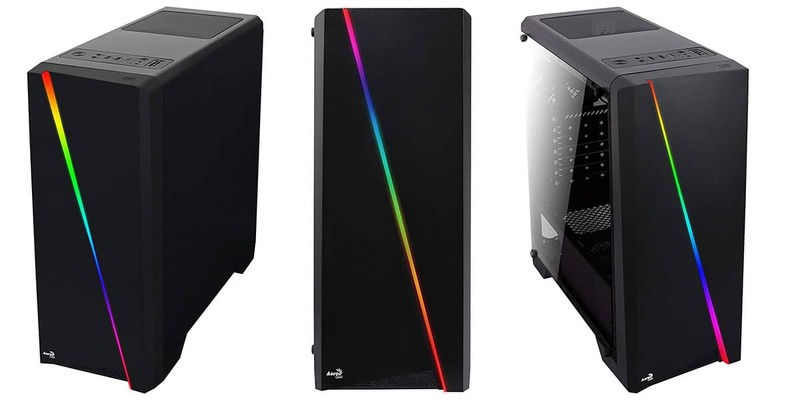 Thermaltake is another well-known manufacturer of PC cases and the V200 Tempered Glass RGB Edition is an affordable and an eye-catching product. It comes with 3 pre-installed intake fans which feature LEDs and have independently controlled light modes. These fans take in cool air from outside, keep your PC’s components at a safe temperature while running and blow the hot air through the additional rear 120mm fan. There is also support for liquid cooling, so if the 4 fans don’t do the job for you, it is possible to install radiators for water cooling. When it comes to connectivity options, you have 2 USB 2.0 ports mounted at the top of the case as well as 1 USB 3.0 port. The I/O panel also includes an HD audio port and a button which controls the RGB light setting of the fan. All ports are cleverly mounted so you can have easy access without even getting off the chair. Lastly, the tempered glass panel lets you gaze at your magnificent gaming computer while playing games and the PSU cover helps to keep those cables organized and hidden from sight. Although this computer case looks terrific and comes at a reasonable price, it seems that this brand has to improve its quality control process. For example, a couple of users reported that the package was shipped with missing components, so they weren’t able to enjoy it at its full potential. Secondly, the legs of it seem to be quite fragile too. One customer reported that all 4 legs were broken upon arrival, so the whole chassis was unstable on the surface of the desk. The Cylon RGB Mid Tower from AeroCool features a unique design thanks to the RGB LED band which stretches across the unit. You are capable of selecting from 7 different solid colors as well as 6 lighting options, depending on your preferences. Speaking of design, the frame also has a side acrylic panel which allows you to peak at your gaming build and shows it to your friends when they visit. This PC case supports high-end video cards up to 371mm in size. When it comes to cooling options, your AeroCool computer chassis comes with a 120mm fan already installed and also lets you add a radiator for liquid cooling. The I/O panel is mounted at the top of the unit and it features 2 USB 2.0 ports, 1 USB 3.0 port, and multiple other connection options. Maybe one of the most aesthetically pleasing features of this unit is its simple and minimalistic design. Apart from the RGB band which can be customized at your heart’s content, there is nothing to distract you from playing and killing those monsters in your favorite MMORPG games! Maybe it is the fault of the manufacturer or the guys who shipped it, but some customers received damaged cases when they opened the package. It is important to contact the manufacturer right away if this happens to you and ask for a replacement or your money back. If you’ve spent most of your money on video games and you have a couple of dollars left for a computer case then the Dual Fans Mini Tower Computer Case from Rosewill might save the day! Although this is super-affordable, it is not a “cheap” product and it features everything a gamer would want in a computer chassis. For example, it comes with one 120mm LED fan in the front and one 80mm fan in the back to blow out hot air. The front fan casts a beautiful blue light which illuminates the inside of the computer and creates a stunning atmosphere while you play your favorite games in the dark. This unit is also equipped with 2 USB 2.0 ports, an audio out port and another connection for your microphone. The control panel is conveniently placed in front of the unit, so you can have easy access to it even when you’re serving soup in front of the PC, watching interesting YouTube videos! When it comes to expandability, this comes with 4 expansion slots, two external drive bays, and two internal drive bays, so you can add hundreds of GB of storage space to your build in just a matter of minutes. Some users report that it can be quite difficult to install additional components such as graphics cards because the screws which hold the case together are difficult to unfasten. Other buyers also complained about the poor build quality as the case arrived damaged multiple times. At the end of the day, this is a good budget case, but if it proves troublesome to you, it is possible to ask for a replacement from the manufacturer. Are you looking for a silent PC case? If your answer is yes then look no further than the Suppressor F31 model from Thermaltake. This is one of the few budget PC chassis which is designed to reduce the noise produced by the cooling fans, so you can focus on your games properly. Speaking of fans, you might be happy to find out that this model comes with one 140mm front fan and one 140mm LED fan at the back, ensuring that your cooling needs are satisfied. This unit is also designed to keep dust at bay, featuring multiple dust filters on top and at the bottom. 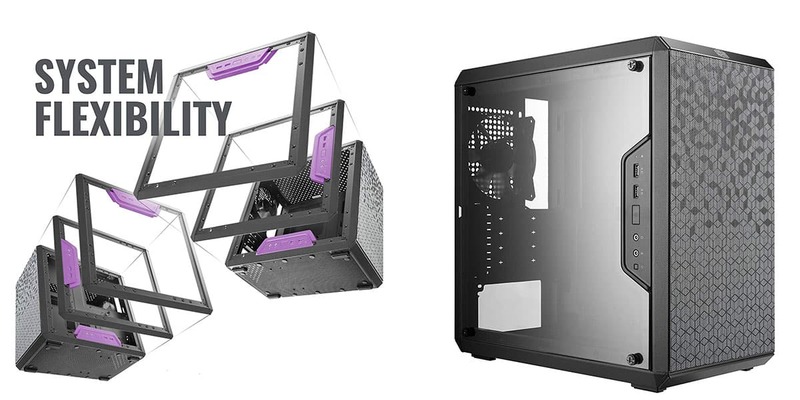 When it comes to interior space, this computer frame comes with a modular system which allows you to install multiple HDDs or SSDs of different sizes. Users are capable of adding three 3.5 inch HDDs as well as three 2.5 SSDs if necessary, considerably expanding the storage memory of your build. The cherry on the cake is represented by the 4mm tempered side glass panel which allows you to see the precious components of your computer at work. Although it has a minimalist design, it scores great marks when it comes to functionality. 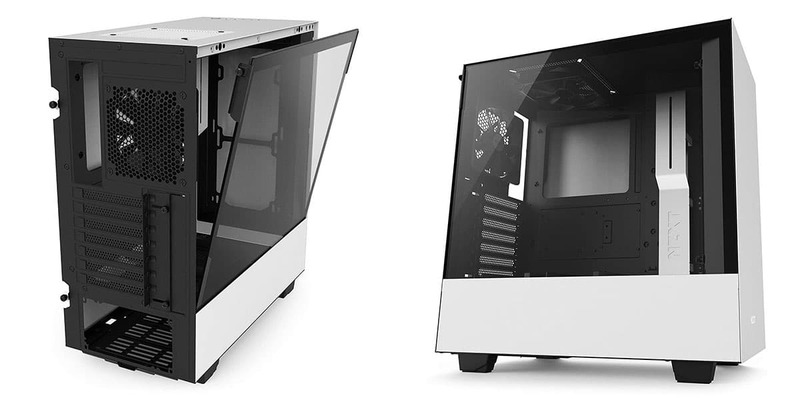 No product is perfect and this case from Thermaltake got its fair share of criticism. For example, some customers complained that the Power button is loose and you can easily break it if you push it too hard. Similarly, one USB port was wobbling inside the I/O panel, as mentioned by a few users, which is a fact that will definitely bother everyone. 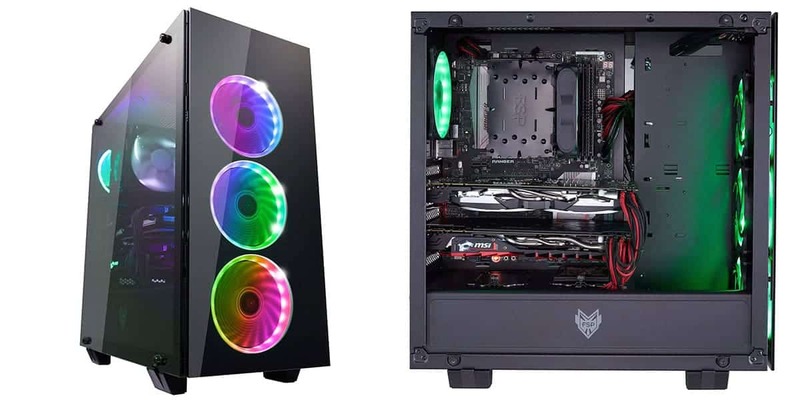 We’d like to present you another exquisite PC case from Cooler Master, a product which is currently a bestseller and comes at a super-affordable price. The Q300L model features magnetic dust filters mounted at the top and at the side of the unit, to prevent dust from getting inside the frame and damaging internal components. A unique aspect of this frame consists of the I/O panel which can be adjusted in 6 different positions and it comes with 2 USB 3.0 ports and one audio port. In fact, you can actually use this in a vertical or horizontal position, depending on your preferences. When it comes to cooling, your MasterBox frame comes with a 120mm rear fan already installed, but it also supports a 240mm radiator for liquid cooling. The drive bay space is generous, allowing you to install several 3.5 inch HDDs and 2.5-inch SSDs with ease. Lastly, the acrylic side panel which stretches from side to side is also a thing of beauty. This little feature improves the aesthetics of the chassis and makes you feel proud of your build while gazing at it every day. Although manufacturers strive to create nearly perfect products, they sometimes make mistakes. For example, some customers complained that they received a scratched acrylic panel which steals from the beauty of the frame. Others have reported that adjusting, assembling and disassembling the unit can be a bit troublesome, especially for people who don’t have much DIY experience. As a piece of advice, make sure that you carefully read the instructions manual when trying to install more PC components into MasterBox Q300L mATX. The last product in our list comes from Rosewill and it is an affordable PC case available in numerous configurations. It is particularly suitable for AMD and Intel systems and it features 4 expansion slots as well as several drive bays for your HDDs and SSDs. Although it comes at a small price in comparison with the others in our list, it manages to bring you everything you need to house your gaming build. For example, it comes with 2 fans, a 120mm one on the front and an 80mm one at the back for proper ventilation. It also supports standard ATX power supply. When it comes to design, this will probably be appealing for those who prefer traditional, minimalist designs, without too many bells, whistles and RGB lights. It weighs about 8 pounds and it will definitely look cool on any desk. It is not a big flaw, and given the price of it, they are understandable, but gamers would probably have preferred to have something better than just 2 USB 2.0 ports. The I/O panel features an audio and mic port as well, but the USB ports seem pretty dated and slow for this year. 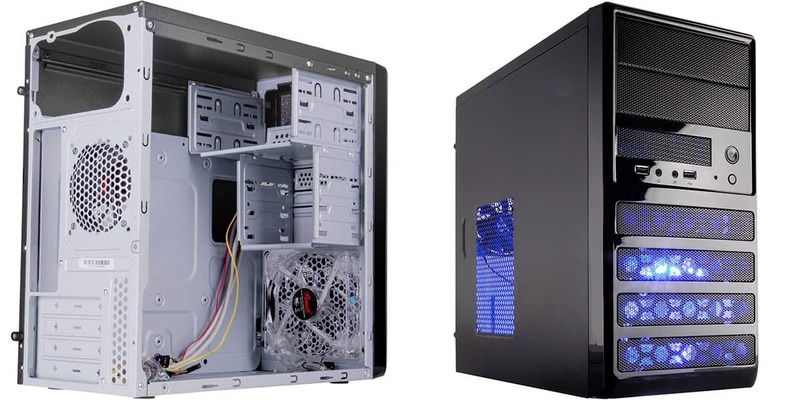 Computer cases come in various shapes and sizes these days and they have been specifically built to accommodate the needs of all gamers. A PC case is essential to house a gaming build with all its components such as the motherboard, cooling system, additional RAM memory, HDD or SSD drives, etc. Before buying a one, it is a good idea to do your homework and determine what features it should have. In 2019, most of them will come jam-packed with useful features, but you should ask yourself a few questions before buying. For example, do you need a large case (provided you also have a lot of desk space) or a more compact one would suffice? Do you plan on adding additional hard drives? What about the cooling system? Would you also want a gaming projector for taking your experience to the next level? For which HTPC Cases might be your best option. This buying guide is trying to provide an answer to all these questions, so sit back, relax and enjoy learning a couple of interesting things about computer cases that will help you make a better decision. ATX stands for Advanced Technology eXtended which is a term created by Intel back in 1995 to determine motherboard sizing. The smallest one is the Mini ITX. The largest one is E – ATX, also known as a full tower. It is important to know that the larger, the more space it has to accommodate PCI slots or cooling fans, among other important components. For example, E – ATX can have up to 8 RAM slots and it is more suitable for expert users. If you are buying for the first time, you’d probably be better off with a Micro – ATX or ATX (mid tower) case as it has everything you need. As you probably already know, electronics (particularly processors) produce a lot of heat, especially if you run resources-demanding applications (Photoshop, After Effects, etc) and games (Counter Strike Global Offensive, Starcraft 2, etc). For most intents and purposes, people are better off with air cooling. Pc cases have special slots where you can install up to 8 different fans in some. Some of the fans draw cool air into the case while the others eliminate hot air on the opposite side. Most of them, even budget ones, come with at least 1 fan preinstalled, but users are free to add as many as they see fit. Liquid cooling, on the other hand, can be more efficient but it also costs more money to install. You’re probably like “wait a minute, water inside a computer case?” Yes, but it is safely circulated through durable hoses to help cool down your computer. It is a safe method and produces less noise in comparison with air cooling. If you’re a professional gamer and you have an overclocked computer (or frequently run complex applications and games), liquid cooling might be justified in this, otherwise, you’d probably better off with air cooling using fans. One of the most “delicious” aspects of having a PC gaming case is the simple fact that you get to enjoy a wonderful display of lights in the full RGB spectrum. Most come with at least 1 preinstalled LED RGB fan which features multiple lighting modes. You either have the opportunity to select the exact color you want using an RGB controller box included in the package or you can select from a preset number of lighting modes such as red, green, blue, yellow, cyan, etc. The beauty of having lights attached to the fans is that they create a mesmerizing, glorious experience while you play your favorite games! Also, many PC frames come with a side glass panel, so the lights will also illuminate the interior of your gaming rig. A complex PC loaded with multiple components such as drive bays, fans, maybe radiators for liquid cooling, etc, also happen to have multiple cables hanging around inside the unit. The professionals who make PC frames have thought of that and they created special cable routing systems which help you manage those annoying cables easier. For example, most come with cutouts and tie-downs as well as straps that securely keep your cables organized and in one place. As a result, not only that your workspace will be cleaner and more organized, but your gaming rig will also look much more streamlined and elegant. As mentioned earlier, users might want to load their PC cases with additional HDDs or SSDs to be able to store those last seasons of Game of Thrones or install games which require dozens of GB of memory such as GTA V or Call of Duty. Today’s ones come with multiple slots for 3.5 inch HDDs or 2.5 inch SSD. For example, you can have 2 additional HDDs installed as well as 2 SSDs to help boot your computer faster and access data at an insane speed. If you do plan to have your collections of movies and games stored in digital format in your PC, you must find out exactly how many additional drive bays you can add to the one you are going to buy, so be mindful of that before purchasing. As you probably already know, high-quality budget PC cases can cost between $25-$30 and $100-$120 for a really attractive model. Anything lower than that price range should be avoided as you will eventually end up with a poor-quality product that will give you a lot of headaches in the long run. When buying a PC case, you should also take a look at the warranty information. Some brands offer warranty periods of 1, 2, 3 or even 5 years for their PC frames. The longer the warranty period, the better you are covered in the case something goes wrong with your computer case. Do I have to buy separate fans or my case comes with them preinstalled? All budget of them come with at least one 120mm fan mounted at the back of the unit. This will be used to blow out hot air, ensuring that the internal components stay cool. However, some PC chassis can include 2, 3 or even 4 fans already installed, with room for additional 1-2 fans. In most cases, 3 fans will be mounted frontally, to direct cool air towards the internal components, and one fan at the back to blow out hot air. Do I need water cooling as well? This depends on various factors. For example, if you have installed multiple fans on your unit and they are still not sufficient for cooling down your gaming rig, you might want to consider investing in water cooling. The best part is that most budget PC cases come with room for a radiator which will be used for water cooling, so you don’t have to make adjustments to the case. 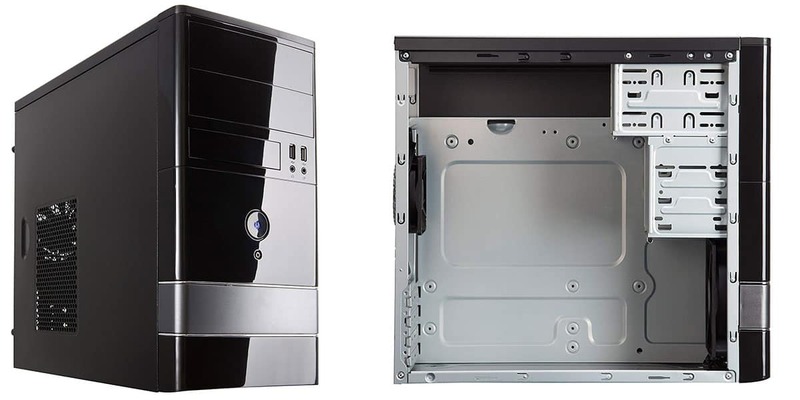 For a better airflow and cooling mechanism, Open Air PC case is one of your best option. How many USB ports are available? The I/O control panel has different ports for connecting peripherals such as headphones, USB memory sticks, etc. It really depends from case to case, but usually, you’ll have at least 1-2 USB 2.0 ports and 1-2 USB 3.0 ports. Some units come with USB 3.1 ports which ensure extremely fast data transmission speeds, so be mindful of that if you copy files to and from your computer on a regular basis. 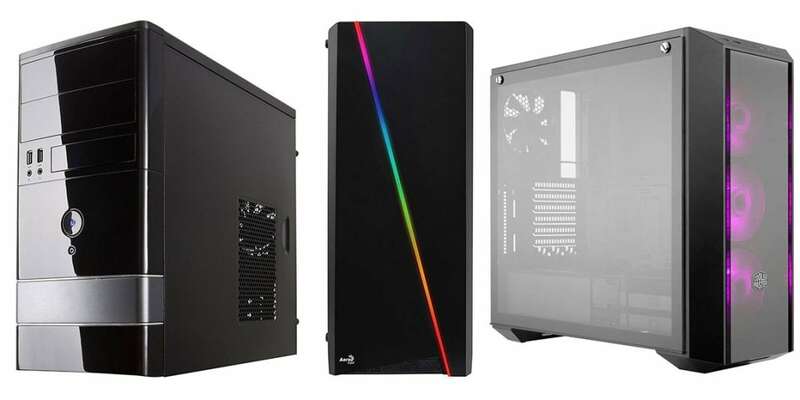 Do cases come with 2 side glass panels or just one? 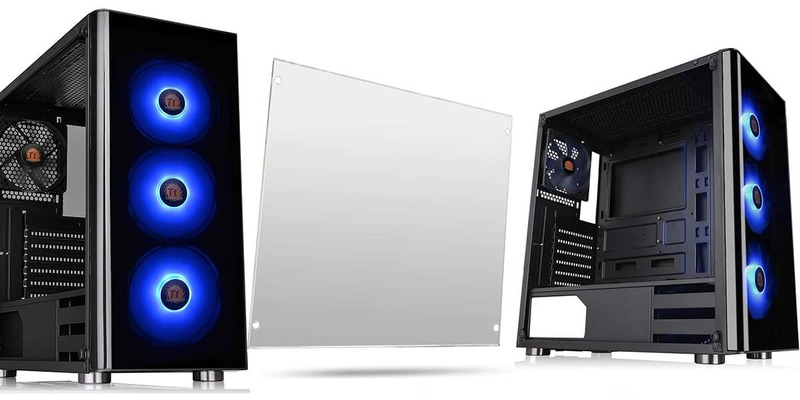 Some PC cases come with a side glass panel which can be made from normal glass or tempered 4mm glass. However, there is always just one side featuring the glass panel, not both. This aesthetic feature gives you the opportunity to admire your gaming rig at work without having to disassemble the case. 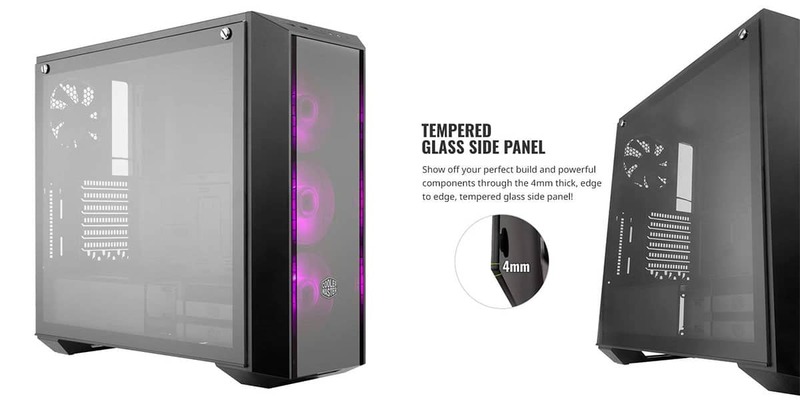 For more details on glass panels and their look on the pc case, you can check out our article in Best Tempered Glass PC Case. Are assembly tools included in the package? If the screws used to put the case together are not that common, the manufacturer might include the compatible screwdriver in the package, but this doesn’t always happen. It is a good idea to ask the manufacturer directly what’s in the package and whether they include tools or not. In most cases, a computer chassis can be assembled and disassembled using patience, a set of instructions and a good Phillips screwdriver, so as long as you have that, you’ll be ok.
As you can see, a PC case can come in so many shapes and sizes and it can have multiple useful features. If you still find it a bit difficult to decide which one is best for you, take a pen and a sheet of paper and prioritize what’s important for you. For example, do you love lights more than anything or you want to be able to install as many HDDs and SSDs as possible? Do you run an overclocked i7 processor which requires a lot of cooling power? When you get an answer to these questions, you’ll know exactly what to look for when shopping for PC cases. Good luck and don’t forget to comment and share this article with your gaming friends, so they can also learn something useful today!